I think at this point, everybody knows how much I love my jean jackets. They’re cool, comfy and super versatile, so it’s no wonder they’re such an important closet staple for me. However, there’s another jacket that’s taken a backseat to all my denim love and it’s time to give it a little time in the spotlight once again. I’m talking about the military parka. I got mine many moons ago at Abercrombie & Fitch (they currently sell very similar ones) and it was one of the best investments I made. Khaki green is one of those colors that goes with almost anything and the style of this jacket does as well. At my core, I’m a jeans + tee kinda gal and this coat is the perfect thing to throw on top on a cooler day when all else fails. Now, this post is not solely about the jacket, though – it’s about getting back to the basics and appreciating how cool casual basics really are. They’re comfortable, they’re timeless and they’re always a great go-to. See how cool I look? Kidding – it’s just my sunglasses. The reflect-ier they are, they cooler you look. Simple. This is one of my favorite pairs of jeans from American Eagle. These are perfect for sitting on random logs on the beach. My t-shirt is from one of my fave stores, Lucky Brand. 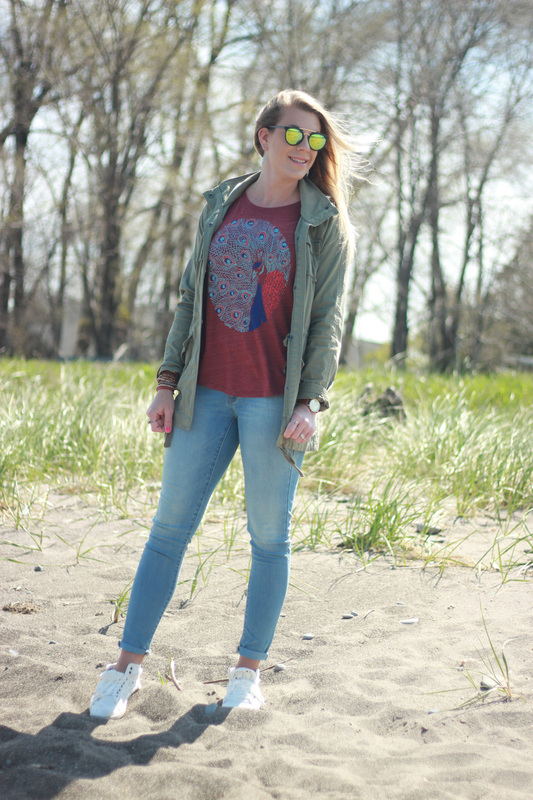 My advice with these super soft, vintage-feel tees is to get them at a Lucky Outlet store. They almost always have an additional 30-50% off their clearance items, which means that you can score a sweet stack of t-shirts for just $5-$10 each. They wash well and they come in the cutest designs! 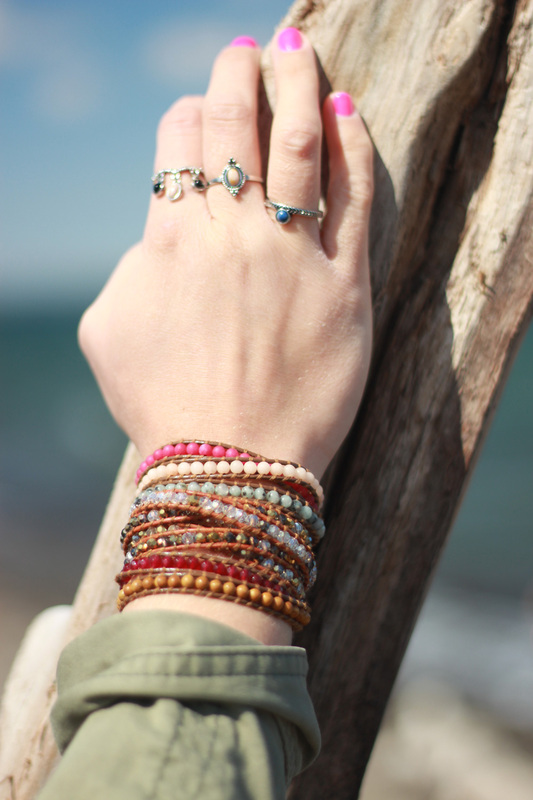 You know the drill: Victoria Emerson for the bracelets. They still have an additional 30% off the entire site, so if you haven’t had a chance to check it out, you still can! 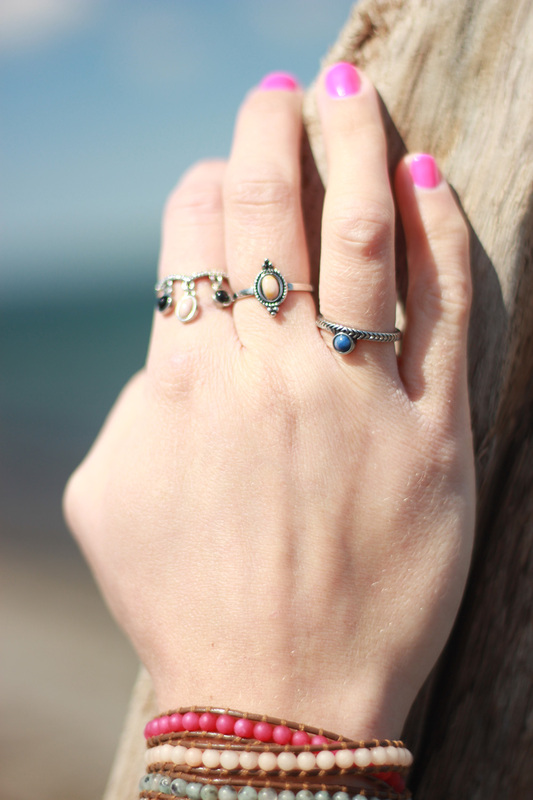 These rings are from H&M – they have the cutest ring selection right now!